 Home › Politics News › Oshiomhole Offered $500,000 Bribe In Cash By Governor...Shocking Report Emerges! Oshiomhole Offered $500,000 Bribe In Cash By Governor...Shocking Report Emerges! 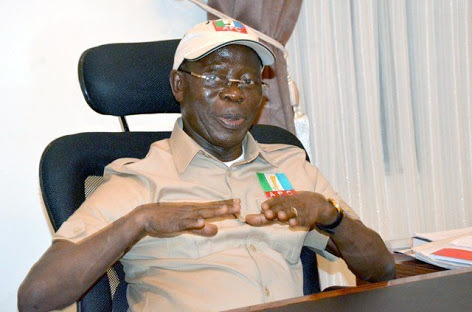 of the All Progressives Congress (APC), Comrade Adams Oshiomhole has being on the spotlight with overwhelming condemnations for refusing $500,000 bribe cash from a governor. The governor wanted the APC chairman to adopt his anointed governorship candidate. Oshiomhole insisted on applying the guidelines of the party for primaries. But where was the so called party guidelines when APC took money from people in Ondo for Forms and still anoint candidates? Why did Shehu Sani lost his ticket to a primary that APC said they did not recognize because of Governor el-Rufai? What happened in Ogun is it different from what happened in Lagos? Did Oshiomole not anoint his successor - both governor and deputy in Edo? To clean the political space, be holistic rather than adopt tricks of favour some, fight some. According to The Nation, there were indications that the APC leadership tried its best to strike a fair deal with Governor Rochas Okorocha on a 55-45 per cent basis. Findings by The Nation revealed that contrary to allegations, the refusal of Oshiomhole to collect bribes from godfathers and candidates accounted for the plot against him. “The facts and witnesses are there. In the fullness of time, the name of the governor will be released.